Sunday, Feb. 24 @ 11:00 a.m.
Honolulu, Hawai‘i — The Hawai‘i State Foundation on Culture and the Arts and the Honolulu Theatre for Youth announce the state finals for Poetry Out Loud: National Recitation Contest. The competition, presented in partnership with the National Endowment for the Arts and the Poetry Foundation, is part of a national program that encourages high school students to learn about great poetry through memorization, performance, and competition. 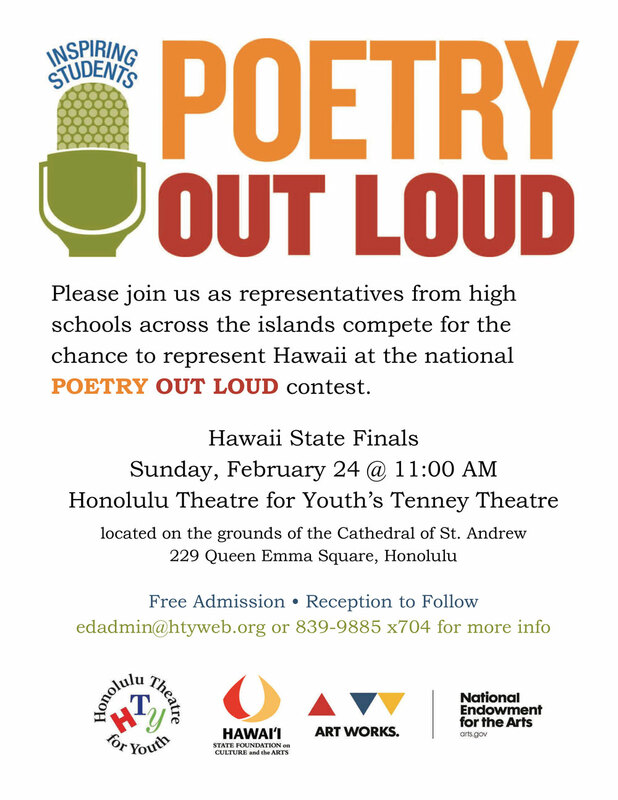 On February 24, 2019 at 11:00am students from 13 high schools located on Oahu, Hawaii Island, Maui, and Kauai, will participate in the Poetry Out Loud state finals at Tenney Theatre, located on the grounds of St. Andrew’s Cathedral in Honolulu, HI. Justine Haka, program manager of the Poetry Foundation will be in attendance for the Hawaii state finals. 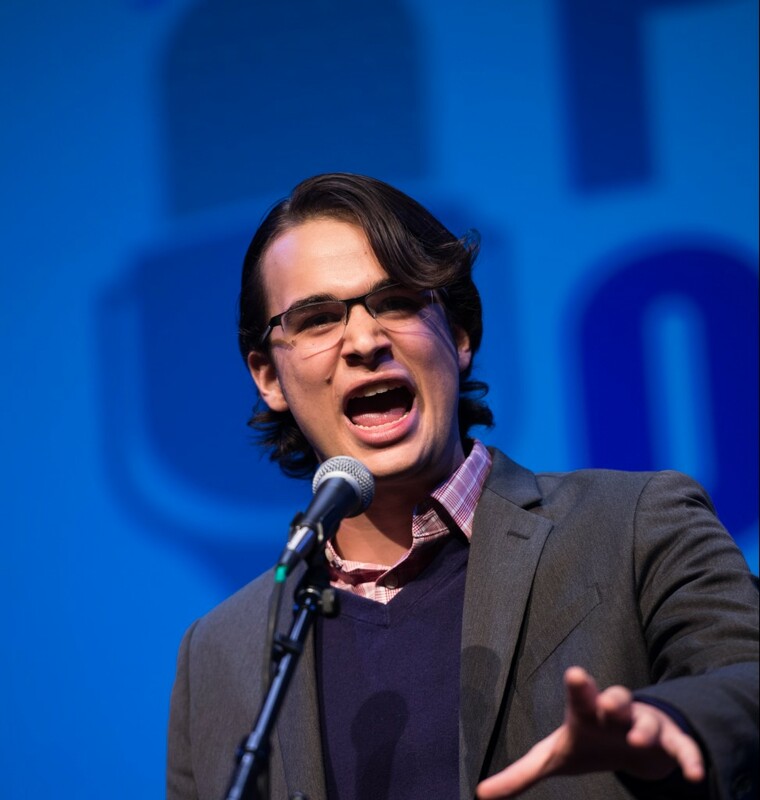 Poetry Out Loud is a national arts education program that encourages the study of great poetry by offering educational materials and a dynamic recitation competition to high schools across the country. Poetry Out Loud uses a pyramid structure. Beginning at the classroom level, winners advance to a school-wide competition, then to the state competition, and ultimately to the national finals in Washington, DC. 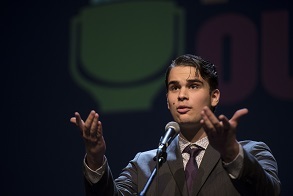 More than 310,000 students from 2,300 high schools took part in the 2017–2018 Poetry Out Loud program. Last year Hawaii student Nicholas Amador of Punahou made history by being the only student to ever place in the top three in the national competition more than once, and Nick did it three times. At Tenney Theatre, contestants will recite works they selected from an anthology of more than 900 classic and contemporary poems. Students participating in the Poetry Out Loud program have benefited from educational materials created by the National Endowment for the Arts and the Poetry Foundation. These standards-based curriculum materials include an online anthology, a teacher’s guide, lesson plans, and video and audio on the art of recitation. Schools are welcome to download these free resources at poetryoutloud.org. “Our teens learn so much from participating in Poetry Out Loud. It expands their awareness of poetry and literary interpretation and they gain confidence in public speaking. It is gratifying for them to have audience support from their peers and family. Poetry recitation is a unique art form and SFCA is proud of the hundreds of Hawai`i students who have participated at all levels of the program,” said Jonathan Johnson, Executive Director of the State Foundation on Culture and the Arts. The winner of the Poetry Out Loud Hawai‘i state finals will receive $200, and the winner’s school will receive a $500 stipend for the purchase of poetry materials. The first runner-up will receive $100, with $200 for his or her school library. The state champion of the Poetry Out Loud Hawai‘i state finals will receive an all-expenses-paid trip (with an adult chaperone) to compete in the national finals in Washington, DC, on April 30–May 1, 2019. 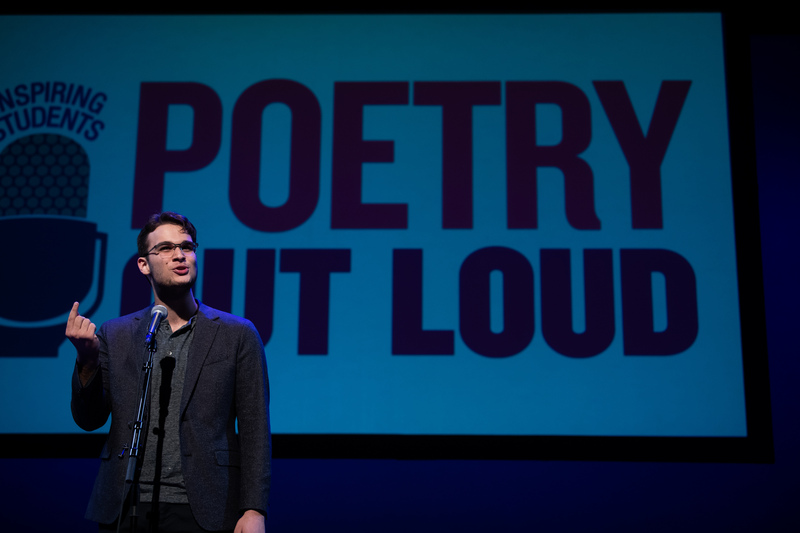 The Poetry Out Loud national finals will present a total of $50,000 in awards and school stipends, with a $20,000 award for the Poetry Out Loud National Champion. The Poetry Out Loud Hawai‘i state finals will take place on February 24, 2019 at 11:00am at Tenney Theatre, located on the grounds of St. Andrew’s Cathedral in Honolulu, HI. The host will be Ben Gutierrez, of Hawai‘i News Now. The event is free and open to the public. For more information on the state finals, contact edadmin@htyweb.org or visit poetryoutloud.org. Honolulu Theatre for Youth is Hawaii’s non-profit professional theatre company providing theatre and drama education programs that make a difference in the lives of Hawaii’s young people and families. Founded in 1955, HTY is recognized the world over as one of America’s most honored theatres. Explore HTY on the web at htyweb.org. The mission of the Hawai‘i State Foundation on Culture and the Arts (SFCA) is to promote, perpetuate, preserve and encourage culture and the arts as central to the quality of life of the people of Hawai‘i. The SFCA holds as a core value support for the appreciation and practice of the arts by people throughout their lives. Find out more at sfca.hawaii.gov.